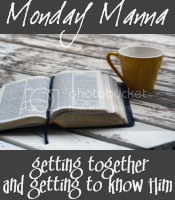 Today is Monday Manna at An Open Book and Joanne gave us a wonderful passage! It's also Joanne's birthday today so be sure to stop by and wish her a happy birthday! This is one of those all-time great passages of the Bible that so many of us turn to quite often. When I read through it this time I notice “And the peace of God, which transcends all understanding, will guard your hearts and your minds in Christ Jesus.” Probably because in the zoo-iness of life peace is hard to come by. So how can I find that peace? How can I consistently have God's peace in my life? I think the rest of the passage tells us how. In every area and every circumstance and situation we're to talk with God—that personal communication with Him that's known as prayer. Not a rote prayer that we simply repeat over and over, but deep, intimate conversation like we have with a sister, close friend or spouse. When we're in close and constant contact with God, His peace is much closer than when we're not. Another thing I think is key to having God's peace is our focus. Is my mind focused on God, and things of God, or is it distracted with the million and one things crowding around me, yapping at me. I've found that, even when I talk with God a lot, I can still have the wrong focus. I can cry and whine and complain constantly to God...and never know peace. Or I can set those things behind me, focus on the good--on God and know His peace, even when the situation is exactly the same. That's the peace of God that guards my heart and mind. It can keep me calm in the midst of chaos just as surely as it keeps me anchored and secure in His Sovereignty. So tell me, have you got peace? YES - that peace is amazing - and I DO have it (LOL though not always!). I actually focused on the one verse you DIDN'T this time. Thanks for the birthday greetings - AND for playing along! It's so easy for me to focus on the wrong things—and react accordingly. It takes deliberate action on my part to take a step back and let God fill my heart and mind. It would save me a lo of trouble if I did it more frequently! Of course, this thought brings to mind lots of hymns to me. Today was my first visit to your blog. And what a blessing. I look forward to visiting again. So much of the nation is engrossed in politics and actually are afraid of the future. What an awesome thing we have - to be able to feel peace in any and every situation. Thanks for this post, Peej. It is amazing how God guides us and directs our paths. I needed be reminded about His Peace today and how He is in control. On the other end of that thought is when God gives us a word, to share. Thanks, Patty. Beautiful devotional. I needed to read it today. Thanks, Peej. PJ, this is so good! I'm thankful for His presence in my life, and focusing on Him is hte only way ot have peace.